The onus of driving a company’s profits and fetch new businesses and clients rests on the shoulders of its sales staff. This applies equally to both online and brick & mortar businesses. There are times when sales representatives are out in the field for obvious reasons. Nonetheless, they are also needed within the confines of the company at the same time to assist administrative staff for varied purposes. It is at such moments the need for cloud service is felt. Cloud Service allows seamless communication between sales staff and office staff, irrespective of their location. Cloud service helps sales staff to communicate with other departments to easily coordinate and exchange documents and information. 1. Chatter: It is a Salesforce communication tool. Chatter is heavily influenced by social media platforms like Facebook. This tool allows you to collaborate in real time by instantly getting user updates (much akin to Facebook feed), and easily share documents and information. It also allows you to create different groups that send necessary information only to the people who need it and convey company announcements and updates. 2. Marketing and Leads: Sales team can use marketing and leads tools that SalesForce offers, which is an excellent tool to keep tabs on leads, lead history, lead status, lead activity, and lead conversion. New leads are entered into the system and assigned to the available sales professional, contact and email information are tracked and stored, notes can be maintained, and appointments can be made all at one place. One can also convert leads into accounts. 3. Email and Calendar – The Email functionality of Salesforce helps you sync your company’s email that you already use with SalesForce Development. On the other hand, the calendar tool helps you can keep track of meetings, issue invitations for meetings and events, and monitor your employee’s schedules so as to better structure meetings and events. This is an amazing feature for management to observe and track sales staff whereabouts and productivity. 4. Analytics and Forecasting – SalesForce implementation allows you to opt for customizable graphs and charts that help you uncode successful marketing tactics, conversion of leads, monitor productivity of sales staff, and what not. 5. Content Library – This functionality lets you upload and store any presentation document or new product information directly in your SalesForce cloud that ultimately leads to the easier location and access by the staff that needs it. 6. Form Creation – It is critically important to gather and store information. Form creation helps you create customized forms for sales staff to fill while in the field. This feature streamlines and organizes incoming information making it simpler for everyone! 7. 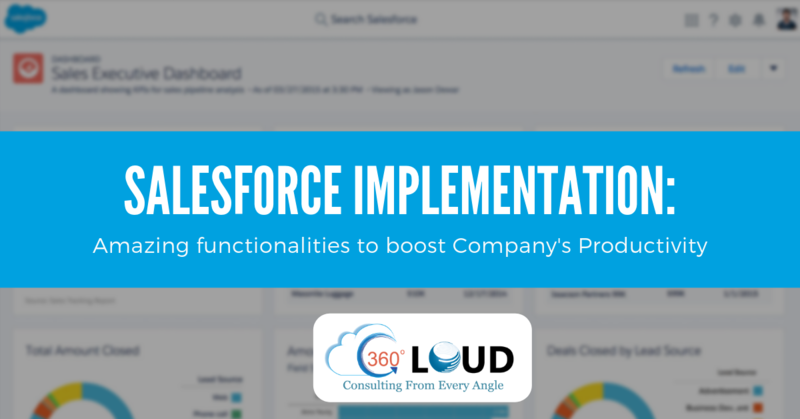 AppExchange – This functionality allows you to discover new applications created by SalesForce to boost your SalesForce experience and chances of success. Are you struggling with Email Deliverability, IP Blacklisting or have been penalized for High Bounce Rate? Struggling with EMAIL CAMPAIGN RESPONSES?